A major housing project in Ørestad by Lendager is moving fast towards completion. It is a wide site from east to west but relatively short north to south and there will be three-storey row houses along both long sides and taller blocks across the shorter east and west ends of the courtyard. Drawings for the scheme show extensive planting in the courtyard with well-established trees and with climbers or plants on the walls of the courtyard and extensive gardens and green houses across the roof. But it seems, from walking around the site, that there could be a very real problems with shadow across the building and across the courtyard. This is not just a problem with this development but a significant problem across the district. A masterplan for this part of Ørestad was produced by the Finnish company ARKKI in 1995 and although the specific form of key buildings - like the new Royal Arena and the recently completed school - have changed from the layout shown then, the arrangement of roads and building plots has survived. However, the housing and apartments as built, over the last year or so, appear to be much higher than originally planned with more floor levels - to increase housing density - so the buildings have a much longer and unbroken area of shadow and that is obviously much more of a problem at this time of year when the sun, although often bright and in a clear sky, is low in the sky. Here, there are tall buildings immediately to the south with just a narrow road between the two developments but the higher blocks at the east and west ends of the Lendager building itself will also throw shadows across the courtyard from the early morning and the evening sun. 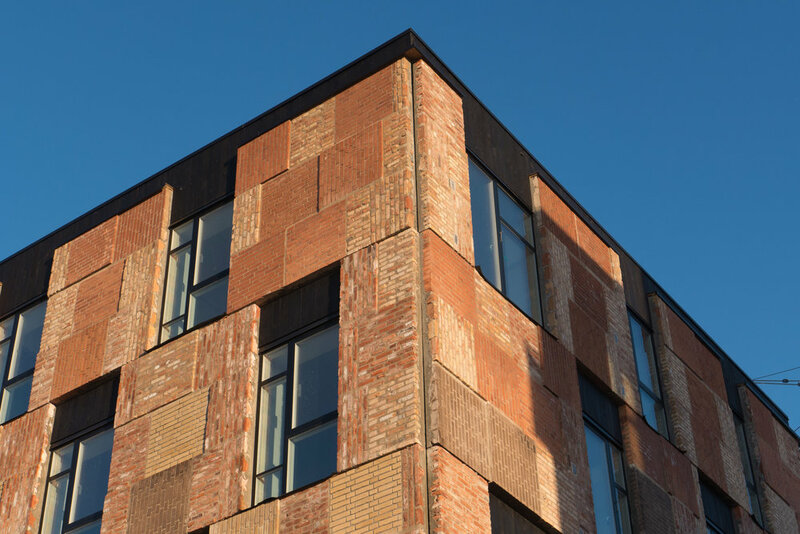 To be more positive, the really striking feature of the building will be the facing panels of recycled brickwork. 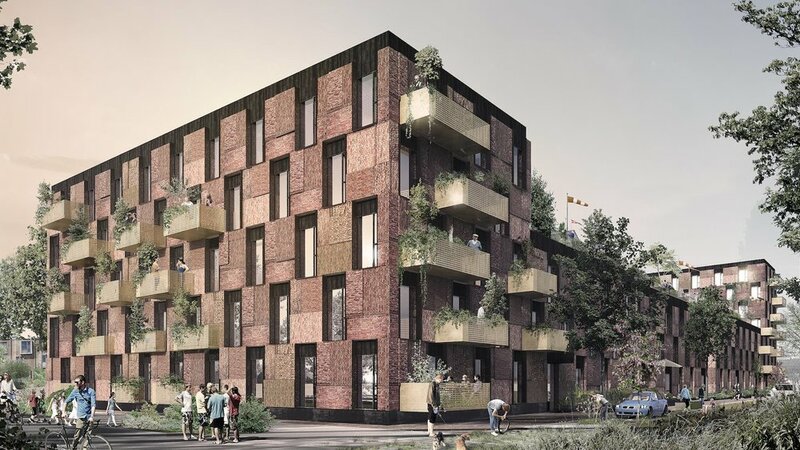 These are not old bricks that have been salvaged and cleaned and re-laid but they have been cut in panels from buildings as they were demolished … in this case buildings on the Carlsberg site in Copenhagen. Old lime mortars tends to crumble away as a building is demolished and individual bricks can be cleaned and reused but modern mortar is so tough that bricks are damaged or shatter if you try to salvage them individually. This method of creating facing panels for new buildings has been shown by Lendager at exhibitions at the Danish Architecture Centre.